Large swings in inflation have affected the United States economy throughout its history. The boom of the “Roaring Twenties” through the banking crisis of the 1980s reflect some of the most volatile periods of inflation America has experienced. A tighter grasp on the U.S. Monetary system and restored confidence in the banking industry stabilized inflation between 0% and 5% over the last 25 years. 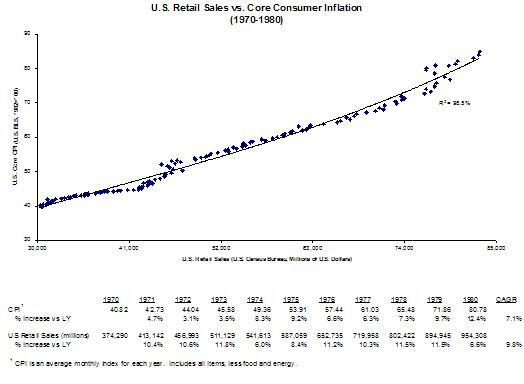 The following graph illustrates the relationship between the Consumer Price Index and Retail Sales during the 1970s. The U.S has reached a pivotal point in the inflation-vs.-growth decision-making process. Americans are struggling, inflation is a real concern and consumer confidence is low. The Fed is under pressure to deliver extraordinary results during these unusual times. The Fed is no doubt stretching its assets to accommodate these promises. For example, at the start of 2008, the Fed had nearly $800 billion of Treasuries, which dropped to $479 billion in early September. With $200 billion pledged to the term securities lending facility and another $85 billion promised to AIG, the Fed’s total Treasury holdings dip below $200 billion. To cure the deficiency, the Fed has to take additional steps to bolster its balance sheet. In addition to requesting the Treasury Department issue debt on its behalf ($100 billion currently), the Fed also has the option of ‘printing’ more money. That, of course, can only further contribute to inflation, which intensifies the problems you mentioned. Unfortunately, at this point, the risk of inflation (and all its adverse impacts) seems to be ‘least bad’ of the possible alternatives. Due to globalization, economies like India and China have a substantial share in the international trade and without having convertible currencies, which has led to global imbalance in price level. This is because their interest rate, cost of energy and all major infrastructure works on controlled price, which is far from the real cost and amounts to subsidization, leading to higher imparity in PPP. Developing economies experiencing robust growth have inflation higher than growth rate, leading to increasing Purchasing Power Parity with Developed Economies. This has led the Inflation rate in the developed economies, twice as much higher than the bench mark of 2%, without substantial increase in money supply and surprisingly also maintaining price stability at higher inflation rate. This has prompted the global developed economies to revisit the concept of bench mark of 2% and price stability. The recent fear of inflation largely arises from the persistent rise in world oil prices.However, inflation due to supply shocks leaves a hard choice for the monetary authority, as any policy reaction will result in output loss. Supply shocks, particularly followed by a spike in oil prices, can put the growth process in reverse gear, as it will push aggregate demand down and stoke cost-push inflation. Unfortunately, monetary policy cannot combat both recession and inflation at the same time. Any attempt to reduce inflationary pressures by engineering a hike in interest rates may exacerbate economic slowdown.